Like many of our family projects, this one came from seeing an item in a store and saying, “heck, we could make one of those, and probably better… or at least bigger.” We were in the Christmas aisle admiring the gingerbread houses when we realized that three out of four members of our family don’t even like gingerbread. However, being a family who enjoys watching Cake Boss on Netflix, we immediately thought of a wonderful replacement material: fondant. OK, it was actually Rice Krispie treats, used so frequently on the show that calling most of their creations “cake” is probably considered fraud in some jurisdictions. 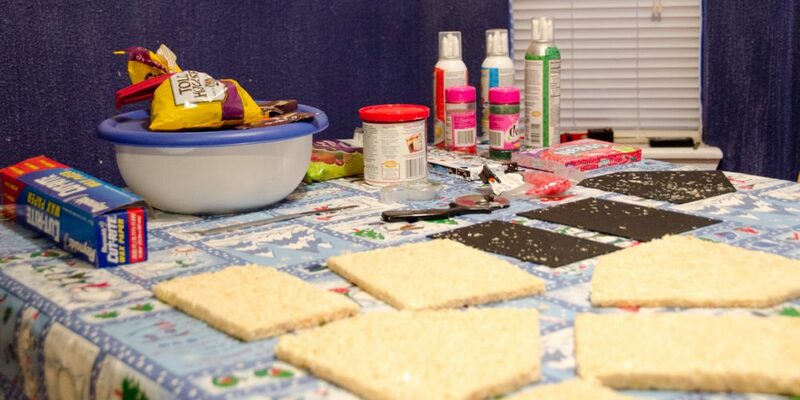 We had seen how easy Buddy and the family used the treats in their creations, and it was a material that we all liked (which is important if, like us, you find yourself spending much of your project time munching on the building materials). 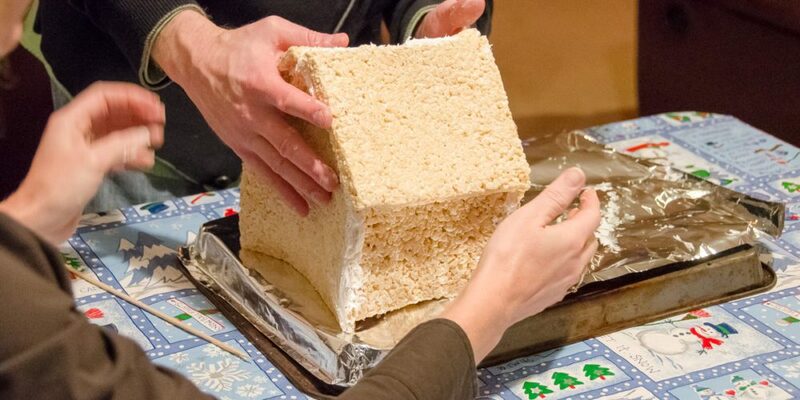 I have outlined below the general method we used to make our Rice Krispie treat house. Keep in mind that this was completely off-the-cuff, make-it-up-as-you-go. There are many things I will do different next time. Some, I’ve described below. Others, I have left out, as they may work out better for you, and part of the fun of any project is the problem-solving. To determine how much Rice Krispie treat mixture you will need, first decide how large you want your house to be, bearing in mind that, like stars (the celestial bodies, not the ones in Hollywood), a Rice Krispie construction will eventually collapse under its own weight (OK, maybe a little like the ones in Hollywood). To prevent this, you are going to need some kind of stiff supporting prop such as bamboo shish kabob skewers, toothpicks, cardboard, Russell Crowe, etc. For our house, we decided on a structure of approximately 7 inches and used bamboo skewers for support. On a piece of cardboard or other stiff material, draw out the design for your house. You will need at least three pieces: the front/back, the side, and the roof. In hindsight, I would recommend cutting out two of each piece and actually assembling your house out of cardboard and glue to use as a base for your house. Otherwise, you may find yourself using bamboo skewer after bamboo skewer to make your house stand erect, a feat that is on par with nailing silly putty to a tree. Remember how, just over a month ago, your house was suddenly filled with bags and bags of chocolate and various sugary confections? This is the perfect opportunity to dispose of those Mr. Goodbars, Sugar Daddies, Dum Dums, and little peanut butter doohickeys in black and orange paper that nobody knows the name of, but which we can all agree are about as much fun to get at Halloween as a can of creamed spinach. This is also where your child’s imagination kicks in. Snow, dirt, grass, foliage, doors, windows, chimneys, water… what can they come up with to simulate these things using various foodstuffs in your kitchen? Following the recipe on the box, make however many batches of Rice Krispie treats are necessary for your construction. Leftovers are great general construction material for making snowmen, wreaths, etc. We estimated that the standard Rice Krispie treat was about twice as thick as we would want to use for construction, so, given that a batch fits in a 9? x 13? pan, we estimated a single batch would make an approximate 18? x 13? slab of treat. Our design required two of these slabs, leaving us plenty of leftovers for free sculpting. After combining the ingredients, dump the mixture out onto a couple of pieces of wax paper taped together, and, using a rolling pin sprayed with cooking spray, roll the treats out to the desired thickness. Place your template pieces on the slab and cut them out using a pizza cutter. Quickly remove the pieces from the wax paper and place on a hard, smooth surface such as a countertop or vinyl tablecloth. They will become less sticky as they cool. 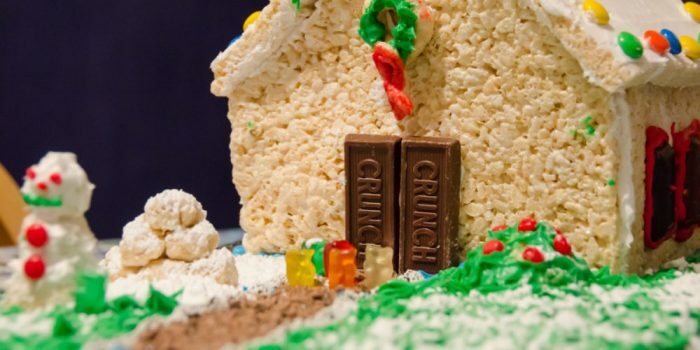 Using cake frosting as glue and whatever support you have (bamboo skewers, cardboard, toothpicks, prayer, liquor), assemble your Rice Krispie treat walls. Next, call your kids back into the kitchen to begin decorating the house, as you’ve just spent the last 45 minutes trying to defy the laws of physics by making a house out of a material that is, ultimately, a liquid at room temperature, and your children wandered off to play Jetpack Joyride or watch Doctor Who about 30 minutes ago. This is the fun part that makes the previous step worthwhile. Let your kids go wild with their imaginations, the Halloween candy, the spare Rice Krispie treats, and anything else in your house that is edible. Crumbled chocolate makes great dirt, powdered sugar gives a light dusting of snow to everything, Rice Krispie treats are like modeling clay. Help them out if they’re having trouble (my youngest had difficulty with the canned icing), but let them try first. You may be surprised at what they can come up with. Also, don’t limit yourself to things that will actually taste good as a dessert. You’re not going to want to eat most of this stuff after a week as a centerpiece anyway, so if cayenne pepper or saltines will look good, go for it. As a family, we have created numerous holiday crafts over the years. 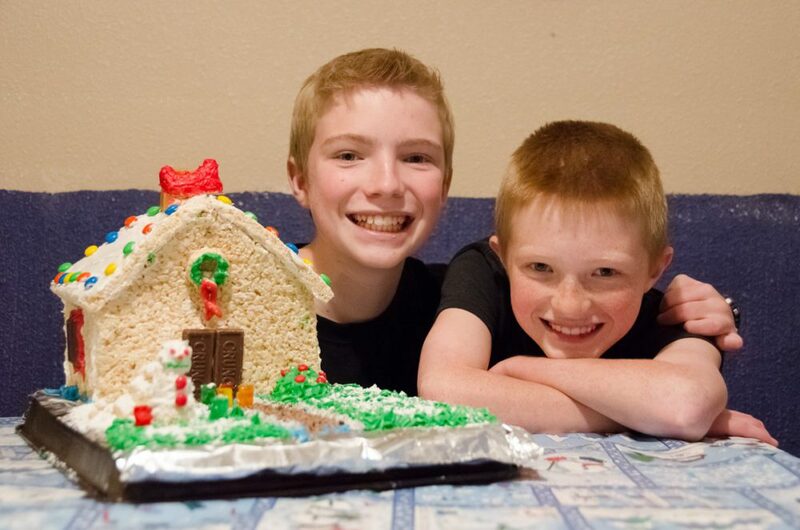 I have no idea why we’ve never done the whole gingerbread house thing, but this now rates at the top of our list.